Hezbollah's leader Sheik Hassan Nasrallah threatened more rocket attacks on cities in central Israel and claimed Israel suffered a "serious defeat" in ground fighting around a Lebanese border town from which troops pulled back on Saturday after a week of heavy battles. The threat came a day after Hezbollah fired one of the most powerful rockets in its arsenal for the first time, one able to reach the outskirts of Tel Aviv. Friday's rocket strike hit outside the Israeli town of Afula, the furthest rocket strike yet. "The bombardment of Afula and its military base is the beginning ... Many cities in the center (of Israel) will be targeted in the 'beyond Haifa' if the savage aggression continues on our country, people and villages," Nasrallah said in a speech aired on Hezbollah's Al-Manar television. Israel "has not made a single military accomplishment" in its 18-day-old offensive on Lebanon, Nasrallah said. Israeli troops pulled back from a Lebanese border town Saturday after a weeklong battle with Hezbollah, the bloodiest ground fighting of the 18-day Israeli offensive. Warplanes blasted bridges and demolished houses, killing a woman and her five children. The Israeli military announced its forces had moved out of the town of Bint Jbail but said its mission of wearing down Hezbollah guerrillas there had been achieved. Military officials said they never intended to take the town. The battle for Bint Jbail has symbolized Israel's difficulty in pushing guerrillas back from the border, whether by air bombardment or ground assault. Eighteen Israeli soldiers were killed in fighting around Bint Jbail. The Israeli military says it has killed between 70 and 80 Hezbollah fighters in south Lebanon in recent days. Nasrallah also dismissed a new diplomatic effort by U.S. Secretary of State Condoleezza Rice, who arrived in Israel on Saturday with American proposals for a resolution to the crisis. She was widely expected to come to Lebanon as well, though no stop has been announced. Rice met with Israeli Prime Minister Ehud Olmert in Jerusalem Saturday evening, and was expected to stop in Lebanon though no visit was announced. She said she was encouraged by a tentative Hezbollah commitment to allow international troops into southern Lebanon and eventually disarm. She said compromises will be needed from everyone. "These are really hard and emotional decisions for both sides, under extreme pressure in a difficult set of circumstances," Rice said. "And so I expect the discussions to be difficult but there will have to be give-and-take." Israel Radio reported Rice plans to travel to the United Nations on Tuesday and hopes the Security Council can prepare a resolution calling for a cease-fire on Wednesday. The report said Israel would not agree to stand down until Hezbollah was incapable of resuming rocket fire Israel. The question of Hezbollah's sincerity toward negotiations is crucial to Rice's second attempt to broker a cease-fire. The United States and Israel insist any deal must ensure Hezbollah guerrillas are pushed back from Israel's northern border before fighting can stop. 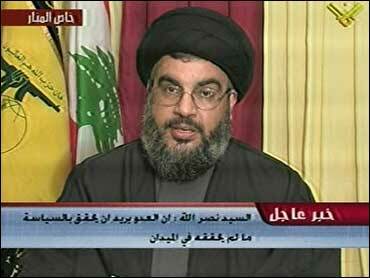 Nasrallah said he would cooperate with the Lebanese government in negotiations toward ending the crisis. But he was vague about how far he would go, and suggested that disarmament would be off the table if conditions outlined by Lebanon are not met  including the resolution of a border dispute with Israel.